What’s the connection between Ada Lovelace, Charles Babbage, and me? Well, it’s a bit tenuous. Apart from the obvious, that we all liked computing (in effect), it is that they appear in a new graphic novel, and I love graphic novels. 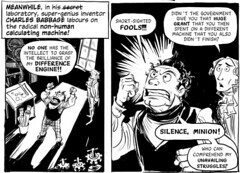 If, like me, you enjoy reading comics and graphic novels, and are interested in Computing, you may already be familiar with the blog called 2D Goggles Or The Thrilling Adventures of Lovelace and Babbage. This relates the story of the development of the Difference Engine and other aspects of the lives of Ada Lovelace and Charles Babbage. Their adventures are based on (mostly) real events and episodes, with a lot of poetic licence thrown in! I thoroughly recommend reading the adventures, and I suggest encouraging your students to do so too. It will help them learn about the development of computing and computer programming in an enjoyable way.